The Bible is sometimes difficult to understand. Because of the historical and cultural significance of some passages it takes some digging to mine the truths and bring them to meaning in the 21st century. In other passages all we have to do is simply scratch the surface and up pops a gem beyond compare. I was reminded of this when a mass e-mail popped in my box with this verse from Malachi along with this illustrating story. Prompted by this verse and wanting to know more about the process of refining and purifying silver, a Jesus follower found a silversmith and started asking questions. She discovered that in order for silver to be refined it had to be held, by the silversmith, deep in the hottest part of the fire. It was crucial that the silver be carefully watched because the silver would be destroyed if over exposed to the intense heat. 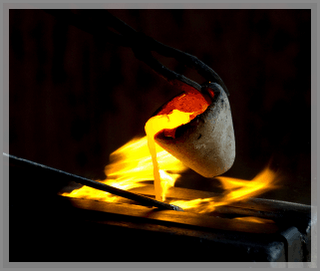 However, it was the heat that burned away all the impurities revealing the value and brilliance of the metal. It doesn’t take much to understand how this connects to our lives! Nevertheless it’s a good reminder--God has his eyes on us at all times. He never allows us to burn unnecessarily. While the heat of the fire may seem beyond our tolerance He’s watching and when He sees His image we’ll be removed. God, you are the master Silversmith. I will be put in the fire I will become a reflection of You.